Toby Stevens, a student on our recent Woodsense Course, managed to take some great photos during his week in the woods (in between spotting snakes and dodging water pistols of course…). You can see what Toby and his fellow students got up to in the Woodsense 2010 section of our Course Photo Gallery. This entry was posted in Bushcraft Courses & Expeditions on June 22, 2010 by Woodlore Team. Being able to track wildlife and being aware of the signs and sounds of nature and what they mean really opens your eyes to the countryside. It’s an amazing skill that can turn the most simple of walks into a true understanding of what is going on around you. Everything you see and hear has a bigger story to tell and I highly recommend anyone who has a love for the outdoors to start learning these skills. I think it’s one of the most important skills I ever learned, and there is still so much to find out. Nice to read the blog whilst watching Extreme Survival on Dave. The courses still look fantastic. Ever since the DorSAR tracking course, I have been wanting to catch up with the Woodlore Team. You will be pleased to know the skills taught on that course have proved effective in the world of search & rescue. We have had a couple of notable searches where the trackers have picked up significant sign & helped achieve a result. Well done to you all for the fantastic courses you offer. 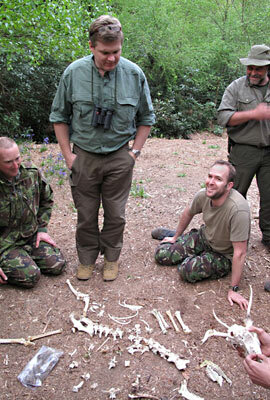 There is no doubt that at the end of a Woodlore course, you know you have been taught by the best.